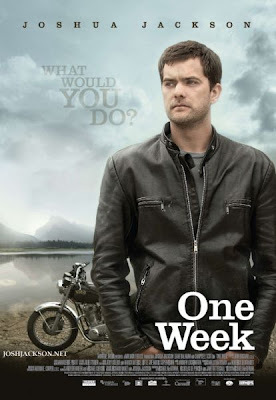 I have wanted to see the movie "One Week" starring Joshua Jackson since I first started seeing trailers for it. I didn't make it to the theatre to see it when it came out, but finally got around to renting it last night. I don't think you have to be Canadian to enjoy this movie, but I have to admit, I LOVED that the whole movie takes place in Canada. I loved the Tim Horton's coffee cups, the newfies and all the beautiful Canadian scenery. The movie has a pretty serious storyline, and a great message. It's about a guy who's probably in his early 30's who gets diagnosed with late stage cancer and how he deals with that. It's not all doom and gloom and is very heartwarming and enjoyable to watch. With it being a holiday here tomorrow, Canada Day, and the weather not suppose to be the greatest, I highly recommend picking up this movie to watch, it will make you proud to be a Canadian. Remember, it's not about when you die, it's how you live! I thought it was an excellent movie! Nothing fancy but a nice simple story with a message. I saw this movie about a week ago. I loved it! I wanna see that movie! It's sucky here too today so we aren't doing too much. I'VE ENTERED A NEW DECADE!